Here at Celebrity Scribe I’m always looking for those nuggets of gold, those pearls of wisdom gleaned from people who seem to have it all, that will bring more insight and enlightenment to my life. Yesterday I was in a reflective mood. Yesterday, Paul McCartney, who I fell madly in love with at the pubescent age of 13, married his girlfriend of four years, Nancy Shevell, on what would have been John Lennon’s 71st birthday (October 9, 2011). I believe Paul’s marital choices say a lot about what the person he is. As I look back over The Long and Winding Road that he has traveled, I’ve been able to extract some valuable lessons from him about love, loss and life. During the height of Beatlemania 1963-1969, Paul McCartney was the world’s most sought-after bachelor. With his mop-top haircut, soulful eyes, and impish grin, he could have had anyone he wanted. So what kind of woman finally captured his heart? Thankfully Paul didn’t choose someone who would have been classified as arm candy. You know the superficial, shallow type that is totally wrapped up in her looks and nothing else. Instead he married rock and roll photographer Linda Eastman – an American divorcee with a six-year-old daughter, who seldom wore make-up and wasn’t interested in the latest fashion trends. And when it came to getting married on March 12, 1969, Linda, who was four months pregnant, wasn’t like millions of other girls who dreamed of a royal wedding to Paul who was considered British rock royalty. She was happy to have a simple civil ceremony which took place at the Old Marylebone Town Hall. LIFE LESSON: Though I was brokenhearted when Paul got married, I found comfort in the fact that he chose a woman who was unpretentious and down-to-earth. Simply put, she knew who she was. That’s not to say she didn’t have insecurities, especially when she received so much criticism from Paul’s fans. But Linda wasn’t concerned with being accepted. It didn’t matter if people liked her. She didn’t have to measure up to anyone else’s standards. We could all use some of that self-confidence. Linda was not seeking to be in the spotlight, though she was thrust into it when she married the adorable Beatle. You can see in some of the videos posted on You Tube that she was uncomfortable being interviewed, which is probably why she often came across as aloof or flippant. The truth is that Linda preferred being behind the lens rather than in front of it. Someone else marrying Paul McCartney may have expected to live a lavish lifestyle, but Linda liked the simple life. Here’s a clip that gives you a glimpse of what it was like at the McCartney’s small farmhouse in rural Scotland where they enjoyed being a normal family spending time with the kids, horse-back riding, romping along the Scottish seashore, and tending the goats and sheep. The most important things to Linda were her family; her involvement in the vegetarian and animal abuse movement, and her photography. She wrote several vegetarian cookbooks, started a line of frozen meatless meals which are still sold in the UK, and supported organizations like PETA (People for the Ethical Treatment of Animals). Sadly in 1995 Linda was diagnosed with breast cancer. Photos show her with scarves to hide her bald head from chemotherapy and later on with very short hair. No wigs, no pretense, no trying to feel attractive enough in front of the world. She wore a smile and held her head high and through it all the man who loved her stood proudly by her side. Paul was totally heartbroken when Linda passed away in Tucson, Arizona on April 17, 1998. She was only 56 years old. For 29 years they had been by each other’s side and out of that loving relationship came timeless songs like Maybe I”m Amazed, Silly Love Songs, and My Love that will forever remind us of her. LIFE LESSON: It’s ironic that Paul’s mother Mary, who he sings about in the song “Let It Be,” also died from breast cancer on October 31, 1956 when Paul was 14. I think the lesson here is that money, no matter how much you may have, (Paul’s estimated worth is more than $700 million ) cannot always save you. Life is precious so appreciate it and take care of yourself. Honor your body which is an irreplaceable, magnificent machine. After Linda died Paul, and daughters Mary and Stella put together a retrospective of Linda’s photographs from her archive of over 200,000 images. The book and the photo exhibit are called Line McCartney: Life in Photographs. Four years after Linda’s death, Paul married Heather Mills. I’m not going to offer any speculation other than to say it was obvious Paul was still grieving and wanted to be in love again. They met at a charity event when Paul presented an award to an animal rights activist and received an award in Linda’s honor. The couple married on June 11, 2002, in an elaborate and expensive ceremony at Castle Leslie in the village of Glaslough in County Monaghan, Ireland. A little more than a year later in October 2003 Heather gave birth to Beatrice Milly McCartney and the couple separated in 2006. It was a difficult time for Paul, a different type of pain and perhaps he felt like a Nowhere Man or a Fool on the Hill, but his Hard Day’s Night came to an end when the divorce was finalized on May 12, 2008. LIFE LESSON: The important thing is that in a world where women get depressed over a couple of wrinkles and a few extra pounds, in a world where many powerful and wealthy men often trade their long-time spouses for younger, prettier, trophy wives, Paul McCartney looked beyond the physical and married an amputee, a woman who had part of her leg missing. Wow! I’m so thrilled that the young man I had a crush on as a child has evolved into a grown man full of compassion and empathy, and the ability to see beyond a woman’s physical beauty to the beauty she radiates from within. You make me proud Paul. And here we are present day and Paul has found love once again. Perhaps it’s coincidence that he has married a woman with similarities to Linda. Both American, both Jewish. Or perhaps Linda had a hand in it all. Nancy was diagnosed with breast cancer in her early thirties around the same time that Linda was battling the disease, and despite their 17-year age difference the two women became friends. After Paul separated from Heather, Nancy was there to offer him some comfort and the two started going out in November 2007. I’m sure it was a very happy, yet nostalgic day for Paul when he and Nancy married in the same Old Marylebone Town Hall that he and Linda had married in back in 1969. It was as if Linda was there in spirit. Once again it was a simple affair and this time the bride wore a simple dress designed by her stepdaughter Stella McCartney. LIFE LESSON: Nancy Shevell is worth an estimated $400 million. She certainly could have had a more elaborate wedding ceremony than that at town hall followed by a small reception at Paul’s home in St. John’s Wood. (It was vegetarian though). It is her second wedding, but she still could have worn an Oscar worthy gown rather than the simple, but classic dress that Stella McCartney designed for her. But she didn’t. Just some food for thought to anyone planning their wedding. Don’t go into debt for one day and feel bad if you can’t do an over-the-top Kim Kardashian style wedding. It is just as meaningful and lovely if it is understated and within a reasonable budget. Make the marriage more important than the wedding. 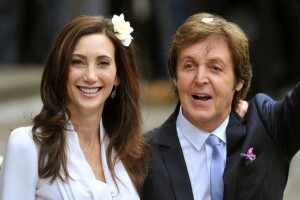 On one last note, it was very touching that Paul chose to get married on John Lennon’s birthday. It was as if love came full circle and those lost were remembered and held close. For you Beatle lovers, here is a video of Paul performing live in the 1990s singing The Long and Winding Road ” with John, George and Ringo recreated in the background. Paul has certainly known the pain of losing his mom when he was only 14 and his wife when he was 57. He’s lost his bandmates and childhood friends George and John. I wish for him years of happiness with his new bride. I love the way Nancy looks at him and touches him tenderly with such genuine love. I love Paul. In fact I married my soulmate Steven on Paul’s birthday, June 18, back in 1983. One thing I know is that you can make it through the hard times. All You Need Is Love.